My expectations were high, and the Invasion proved itself from the get-go, even before reaching the festival proper thanks to the town that surrounded it. Bright and early Saturday morning, while most pirates were still sleeping off pre-event festivities (more on that soon), shopkeepers were setting out signs promoting discounts for pirates, raising jolly rogers outside storefronts and donning plastic tricorns in an effort to trade coin for jerky, trinkets and water with passerbys on way to the grounds. There’s just something strangely endearing in the sheer enthusiasm displayed by each of these gift shops, convenience stores, restaurants and all. 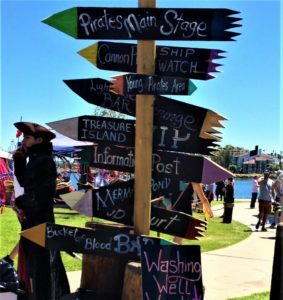 It’s as if the piratical fervor of the fest just couldn’t be contained, instead breaking loose and infecting the surrounding area with a charming sort of secondhand swagger. From where I stood, the fest could be reached by one of two routes. On foot would be a 20 minute walk around the marina dodging barely- to uber-piratey storefronts and street vendors all the while. Or there was the ferry to jet me straight across, but that was far more than five minutes wait and I was in no mind to dally. So the walk it was, passing bus stops, the aquarium and a burial at sea service until I soon crossed to Invasion-land. It’s remarkable what happens to a plain old park when you fill it with pirate stuff. A spiral of vendors packed like capitalist sardines selling swashbuckling miscellany at every inch—and I mean that with nothing but love. I even bought a mug. But first I bought a pineapple. Hollowed out and filled with piña colada with a little umbrella which I was soon sharing with a familiar mermaid. Which brings me back to that whole gathering thing. Caribbean Pearl, like many of the seasoned hands working the grounds, was an old friend I’d not seen in a small age. And, like the rest, on spotting each other it was like it hadn’t even been a day. Truly, pirate friends are the best friends. Although she did nearly kick me to the curb once she learned my piña colada was down to the dregs. But that’s the true attraction of these events. The pirates. Those salty folks that bump into each other once, twice or a hundred times from one event to the next, treating each other like very best friends whether they see each other every weekend or every decade. So long as you have swagger—and rum—you’re welcomed. (Trade secret, the rum is actually optional. But it certainly doesn’t hurt.) And all this is what makes an event like Long Beach Pirate Invasion all too rare. 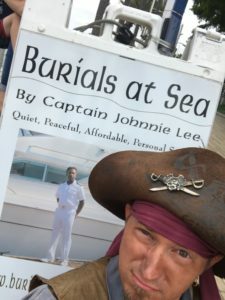 There are many pirate festivals, some quite extraordinary. But pirate gatherings are less common. In my experience the late PyrateCon was the best. And Fells Point back in 2010, host of the Order of Leviathan’s original Devil’s Dozen ceremonies (foreshadowing!) boasted more that a small fraternal quality. But mostly, pirate-mingling takes backseat to pirate-performing. And, speaking as a mingler, this leaves something missing. This is why, for me, the highlight of the weekend came long before the opening cannon. 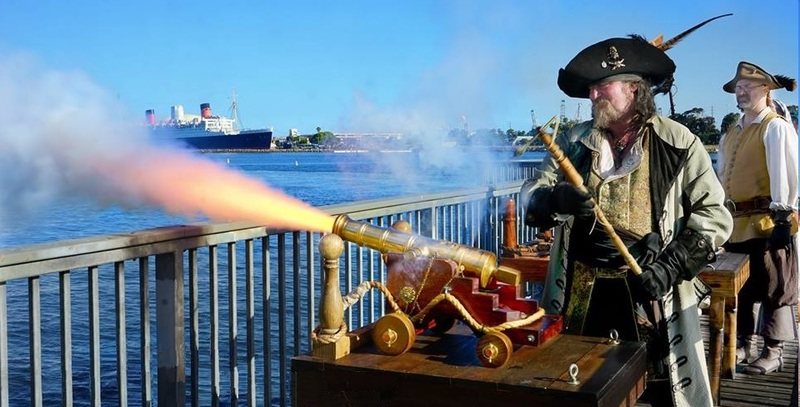 The Invasion drew pirates far and wide, and while they were surely spread throughout the hotels of Long Beach, Friday night before the fest Queen Mary was our ground zero. I myself spent the first half of the evening locked in my room due to a key mishap, but fortunately a fresh bottle was at my side. So I did the piratical thing and took some shots for Instagram (sort of a double play on words there). Still, I was already in high spirits as a chance encounter earlier in the lot saw me parked directly between none but Scarlett Harlott and Jack Spareribs, the very first of old friends I’d be encountering that night. They in their piratical black T’s and jeans, me in a tie. I’d just had a meeting at the worldwide headquarters of Panda Express for reasons I’ll not go into, but they had the good grace to forgo mocking my lubberly attire and instead welcome me back to the fold. Like I said, pirate friends are the best. Of course, this became all the more apparent when I was finally sprung from my admittedly comfy Queen Mary cell and found my way to the Observation Deck, where pirates frolicked by the score. I’d take this moment to name names, but it would read like the Gospel of St. Matthew and all those begattings, and I’d still miss a few. Suffice to say, this was the precious opportunity to carouse in and amongst the brethren proper, free to curse like sailors and order girly drinks without anyone thinking the lesser. And, as wonderful as the rest of the Invasion was, this is the experience that will first and foremost draw me again in 2019. But perish any thought that the pre-festivities overshadow the Invasion itself. And I’d be remiss if I didn’t share a few highlights. The Pirates Charles has lost none of their verve since last I saw them, and meeting with Jack Gonzo was a delight. It’s the first time I’ve seen him since he started his brilliant show Scoundrel’s Inn, which I highly recommend if you’ve not yet tuned in. 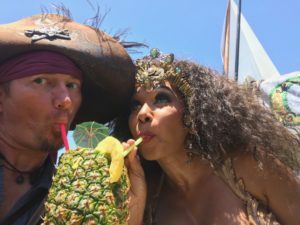 I mentioned the merfolk, where Caribbean Pearl, some maids, and a handful of mermen meant something for everyone—except perhaps those that hate tails. 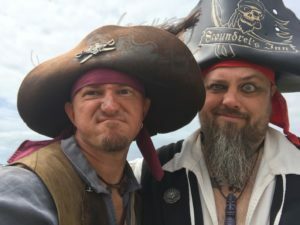 Piratical support and demos were provided by Imagine Pirates and Rogues of the Golden Coast, and monkey shenanigans by world-famous Maynerd and his assistant Jack Spareribs. There was the Merry Wives of Windsor, sword swallowers and crusty jugglers, plus costume contests hosted by Phil Johnson of Under the Crossbones. Even a bar atop the hill. In short, everything you need to make a pirate weekend shine. And then, for a fortunate few, a little something more. Some eight years ago I was privileged to witness the birth of the Order of Leviathan, a then fledgeling group of some 12 (no, 13. Rather, 14. 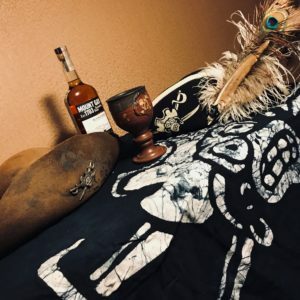 I mean, I give up) pirates, an esteemed assemblage honoring those most dedicated to taking the black that’s since grown both in multitude and repute. And, on Saturday night of this invasion, it was again my honor to participate by way of guest, witness, tagalong to this latest, much less public initiation celebration. It was aboard a tall ship at sea and with 12 inbound members (no, 13. Now 14. Pirates gonna pirate) that the Order toasted their fallen, welcomed their new, and reveled in pride at this distinguished number which must now rank north of 100. The speeches were moving, the company lively, the rum plentiful. Which likely accounts for my memory of the matter being a touch hazy. 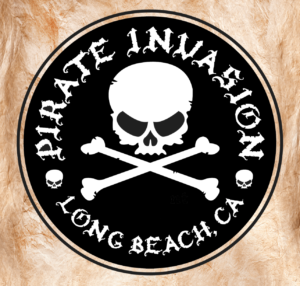 I’ve been to more than a few pirate festivals, and Pirate Invasion Long Beach definitely ranks toward the top. It’s got a fine mix of shows, shopping, and—as mentioned—opportunities to meet with, hang with and drink with a smattering of the most delightful rogues you’ll ever chance to meet. I’m mighty looking forward to 2019, and heartily encourage any and all to do likewise. 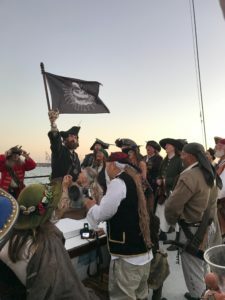 This entry was posted in Commentary and tagged bilgemunky's favorites, california, festivals, long beach pirate invasion, order of leviathan, southern california by Bilgemunky. Bookmark the permalink. Awww me mates, what a grand time was. Sharing a Caribbean drink with you take me back to me native island of Puerto Rico. But next time don’t forget to add a lit’ bit o’ rum in that drink.